The origin of music itself is very difficult to determine because in all probability, it is likely to have begun with singing and clapping or beating the hands on different surfaces, for which there is no of course no archaeological record. However, between at least 60,000 and 30,000 years ago, ancient humans experienced a type of ‘cultural explosion’ – they started creating art in the form of paintings on cave walls, jewellery and ornaments, and to bury their dead ceremonially. If we assume that these new forms of behaviour reflect the emergence of intentionality, then music as we know it must also have emerged at least during this period. Evolutionary scientists believe that a musical culture would have helped prehistoric human species to survive because the music coordinates emotions, helps important messages to be communicated, motivates people to identify with a group, and motivates individuals to support other group members. The oldest musical instrument ever discovered is believed to be the Divje Babe flute, discovered in a cave in Slovenia in 1995, though this has been disputed. The item is a fragment of the femur of a cave bear, which has been dated at 60,000-43,000 years old, which had been pierced with spaced holes. Scientists who could not accept the possibility that Neanderthals were playing music rejected the claim and said that the perfectly spaced and neatly carved holes are in fact the result of the bone fragment having been chewed by an animal. However, a general consensus that the Divje Babe flute is actually a musical instrument has been growing as the view of the Neanderthals from subhuman brutes to more sophisticated humans is changing. The cave in southern Germany contains early evidence for the occupation of Europe by Homo sapiens and on announcing the discovery, scientists suggested that the "finds demonstrate the presence of a well-established musical tradition at the time when modern humans colonized Europe". They suggested that music may have helped to maintain bonds between larger groups of humans, and that this may have helped the species to expand both in numbers and in geographical range. 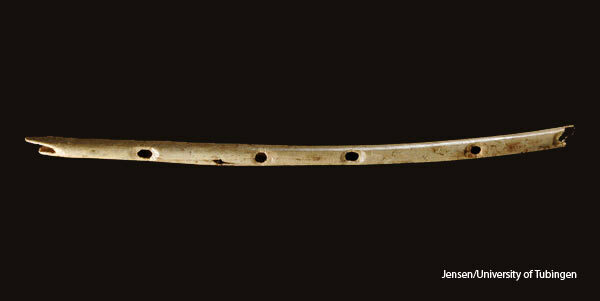 Those who have rejected the finding of the Divje Babe flute have claimed that music played a role in the maintenance of larger social networks which may have given modern humans the edge over the Neanderthals. However, looking at the images of the Dibje Babe flute, which dates back to the time of the Neanderthals, it seems quite ridiculous to assume that it was made by the tooth holes of carnivores. Would be nice to have included in the article the actual flute sound, some how. I agree with the point made in the article about this not being a musical instrument. There is no way this thing could have produced any music. The holes are on both sides making it impossible to play. Well no. It has been played in Werner Herzog's Cave of Forgotten Dreams documentary. It's on Netflix at the moment.